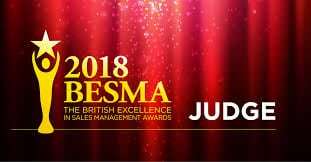 Anna Britnor Guest has been announced as a judge for the 2018 British Excellence in Sales Management Awards (BESMA). Organised by the Institute of Sales Management, these are the sales industry’s top awards which reward the efforts of individual sales professionals and teams in driving company performance, as well as recognising the key role of professional sales in creating a thriving UK economy. Judges are selected by invitation only and Anna’s invitation is on the back of a 30 year successful sales and sales development track record and as a Companion of the Institute of Sales Management (CInstSM). Nominations are open to all companies with a UK sales presence and close on 2nd August. With 30 years sales experience in complex B2B markets, Anna helps companies to adapt and grow in fast changing sectors, particularly in technical & IT B2B fields. Making a positive difference it what it’s all about and her approach to sales consultancy, skills training and capability development is designed to deliver against client goals. As a judge for BESMA, Anna is committed to supporting ethical and professional sales development. Anna is also committed to excellence in learning and development and is currently undertaking the Brinkerhoff High Performance Learning Journeys certification.